Chooey is a real barker... especially when there are unknown beings lurking near the house e.g. evil cat, evil pigeon, evil stranger dogs. So today's guest post is all about ways to stop dogs from excessive barking, brought to you by Mr. Dzhingarov. All dogs bark. Some will only do so when there is a good reason while others just keep barking without any apparent reason. We have some breeds that will bark more. No matter the case, there are many situations in which we want the dog to be quiet. That is what we will talk about now. 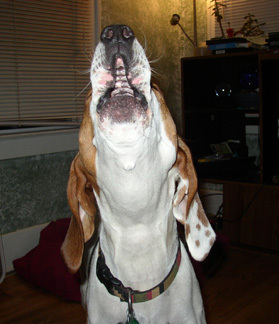 Some breeds are inclined to barking due to their natural instincts. The one thing that we need to understand is that we should never stay focused on completely stopping the dog from barking. This is especially true when the bark is an alarm sign or something that would ward off a thief. What we want to achieve is having the dog stop barking in the moment we tell him to do so. In addition, the dog should bark only when there is a reason for that. There are many situations in which pet owners end up associating the barking with something great that happens in the pet’s life by offering affection when barking is loud or calm praising voice. The head halter is useful when the dog often barks or sports at other animals and people. Introduce the dog to the halter and when there is a bark that is not wanted, simply lift your leash. That will close the mouth of the dog and you can guide him towards sitting. When you teach the dog to enjoy carrying various objects, he will not bark and will do so less than before. The only problem in this case is that you have to be careful so that you do not offer a toy or something to carry when a dog barks. If you do that the pet can mistake that toy as being a barking reward. This is a pretty interesting exercise that has a lot of extra added advantage so you should consider it. You start by basically making the dog bark. You can do so by having someone ring the doorbell while you have the dog on a leash. The purpose is to teach your dog to bark when the doorbell rings and then be quiet when you give an appropriate command like “Quiet”. Have a dog bed (ZeiPet manufactures some great ones) close to the door. Teach your dog to go sit on the bed and look at the door when you give the Quiet command. The person behind the door hears the dog barking and then hears you say Quiet. When you open the door the dog looks at the door attentively so you basically let off the idea that you control the dog for possible intruders. This is perfect for dogs that bark for no reason. Whenever barking starts, you can distract the dog by slamming a drawer or a cupboard or simply throwing a can with pebbles on the ground. What counts is that the dog does not see you make the movement. The dog will stop barking and you pay no attention to what happens and just go on with your regular activities. When the pet starts to see that when loud barking happens bad things also happen around him, he will stop barking. However, you need to learn how to distinguish between the barks so that you do not stop him from barking when he needs to go to the bathroom or something like that. Great tips and ideas. We don't have a bark problem which is great. Sometimes we like to bark just to wake everyone up! Thank you for your kind comments re Pippin and please help yourself. We honoured that people care and have kind thoughts for her and us. We miss her immensely. Whisky hardly barks. In fact, she never knew how to bark until she was about a year old after many barking lessons from me. Hahaha. We always bark for a good reason.....cats, birds, strangers, playing......that's our opinion. Ruby doesn't bark at all, but Pip liked to bark. To answer your question, we haven't decided if her name will be Ruby Rose or Ruby Lou. Lol. Being kitty peeps (uh, or something like that) this was all news to us. Interesting! Education the dog to cease barking needlessly is fairly easy with all the bark collar.